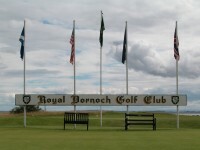 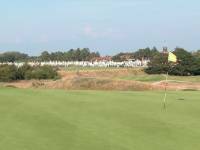 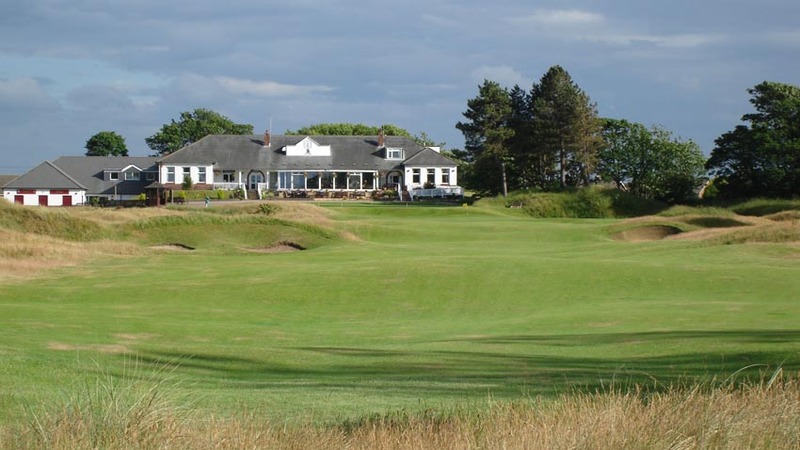 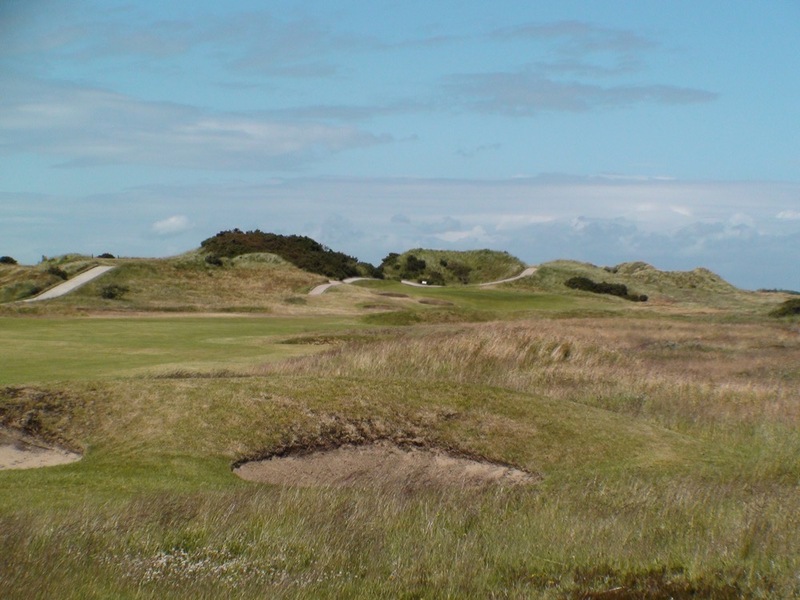 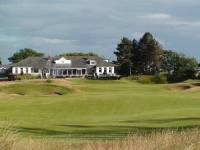 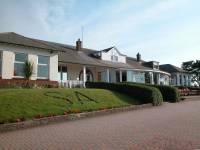 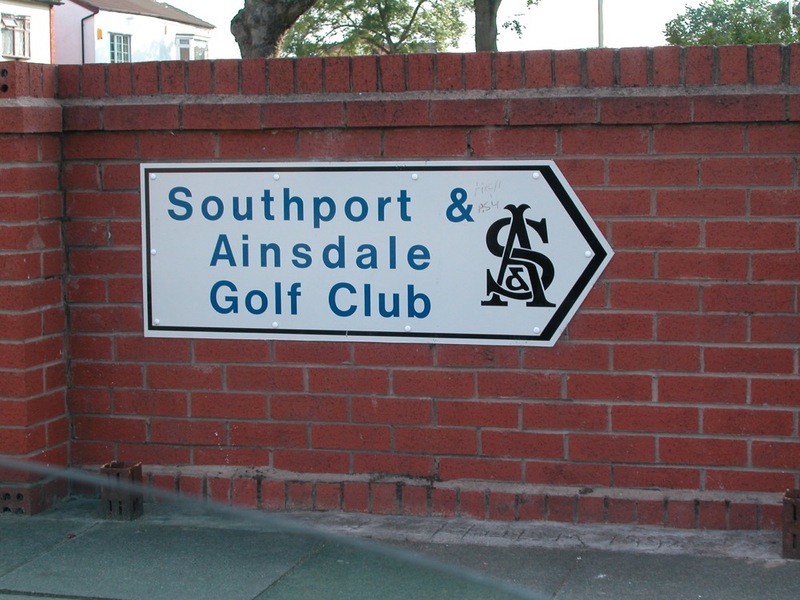 Keep heading south on the Merseyside England coast, from Royal Birkdale and Hillside on the way to Formby, and you’ll pass the Southport and Ainsdale Golf Club, one of the first Ryder Cup venues, having hosted the international competition in 1933 (won by the J.H. 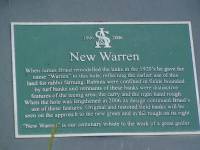 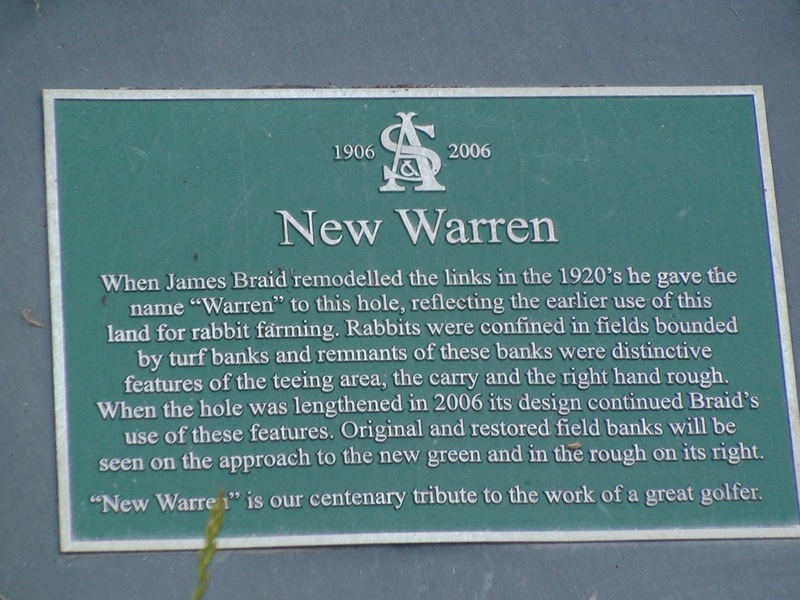 Taylor-captained British squad over Walter Hagen’s US team), and again in 1937. 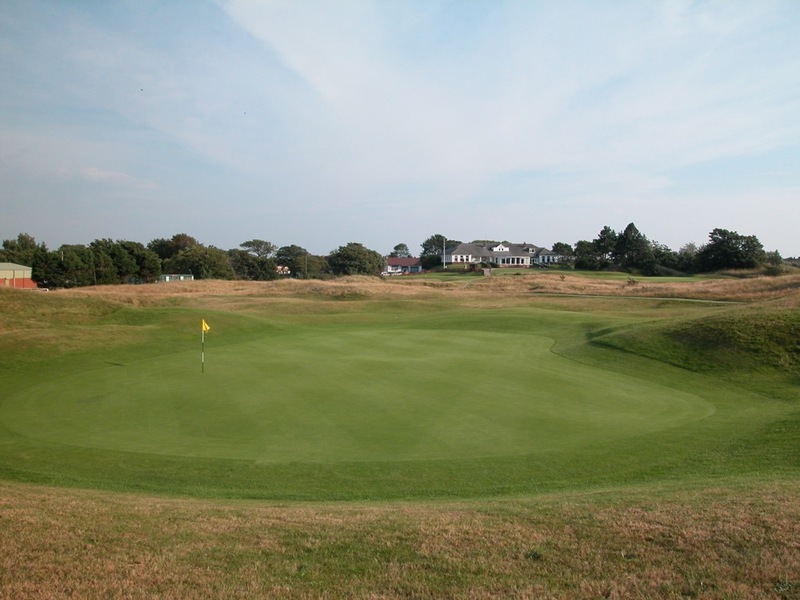 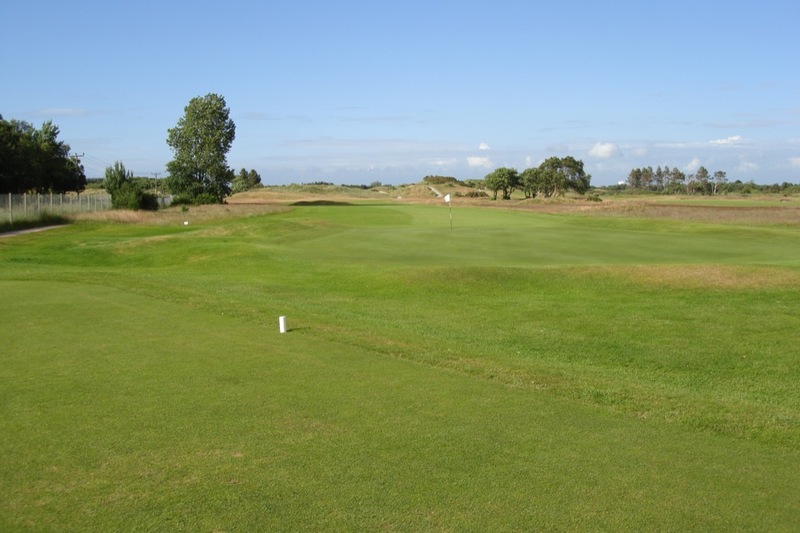 This grand old links at Southport and Ainsdale Golf Club means business right from the 1st, a testing par-3 measuring over 200 yards from the back tees, aptly named “Trial” with no less than 9 steep, sod-faced bunkers guarding the green. 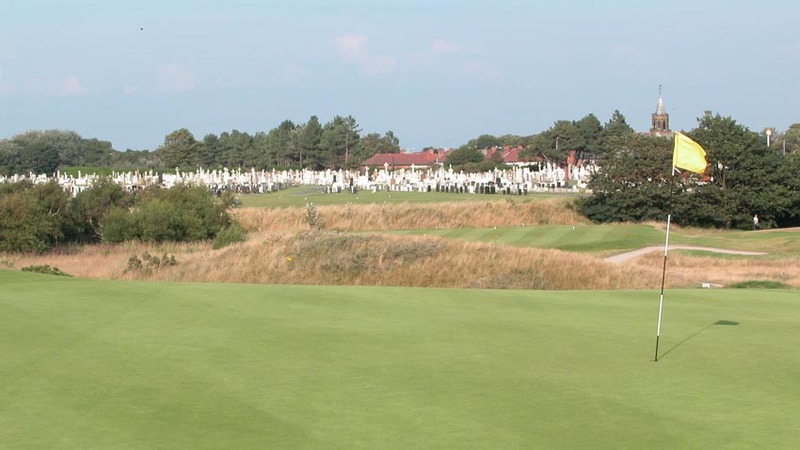 Our favorite view on the front nine at Southport and Ainsdale Golf Club is the 8th green, looking back downhill to the tee, with an impressive graveyard and church steeple standing watch in the background. 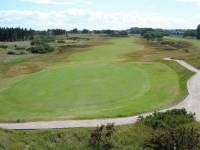 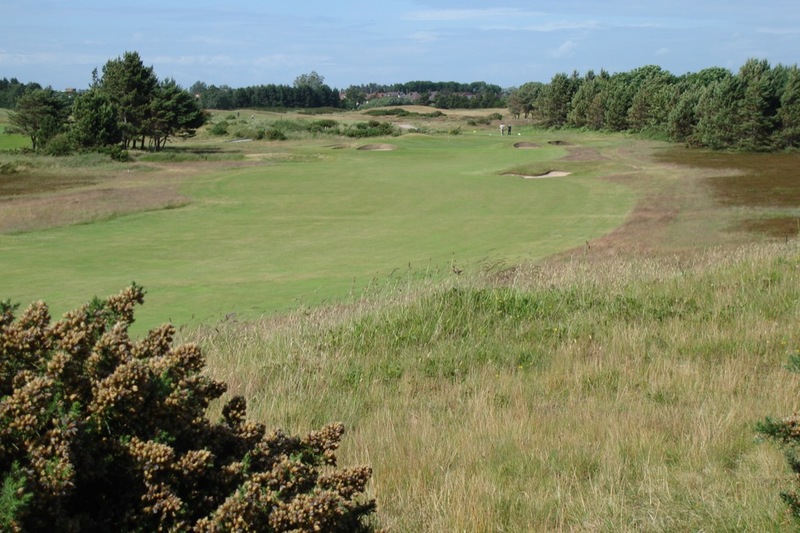 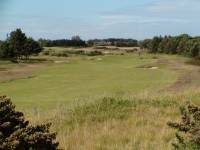 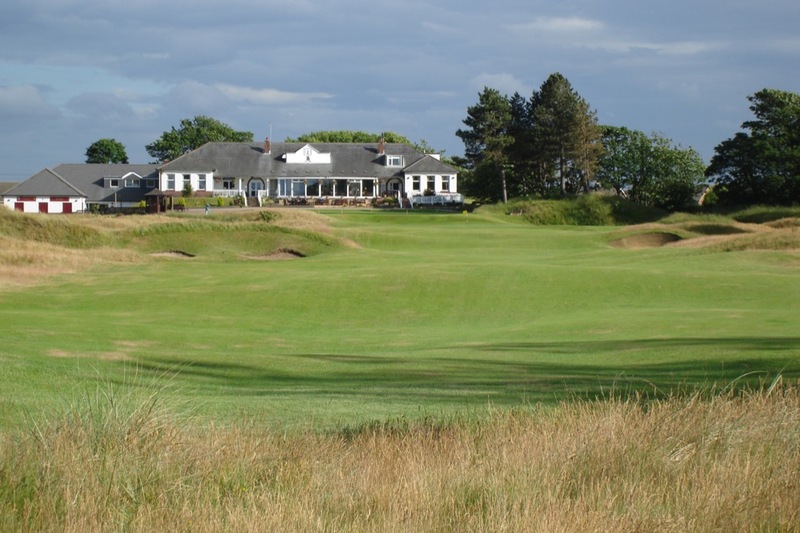 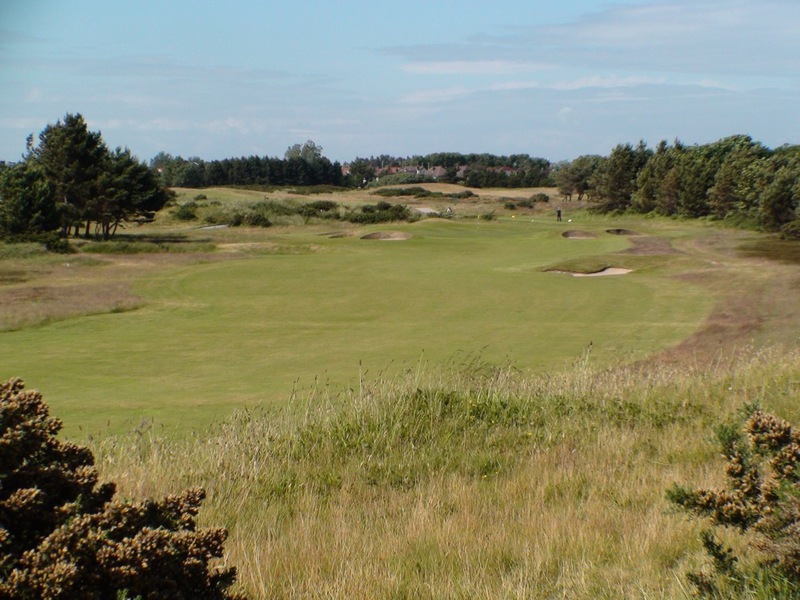 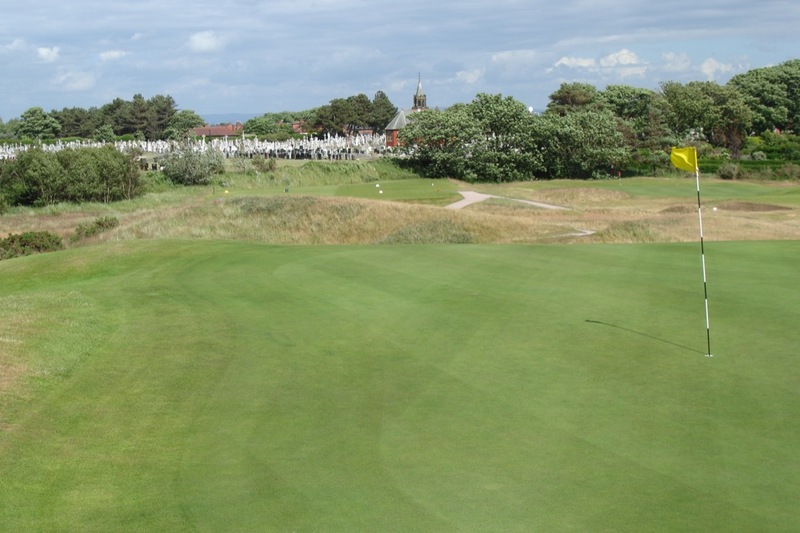 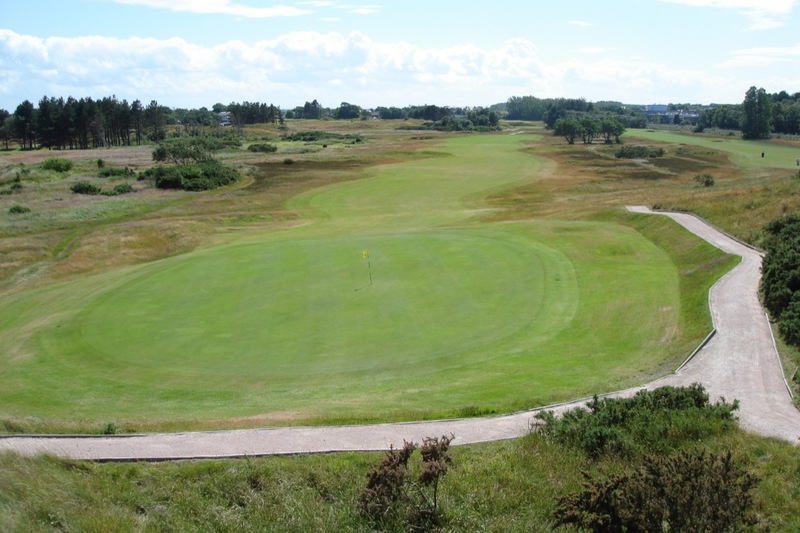 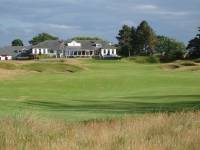 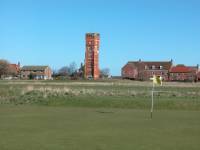 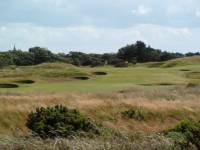 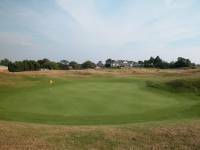 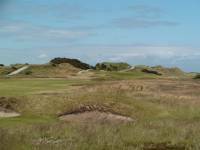 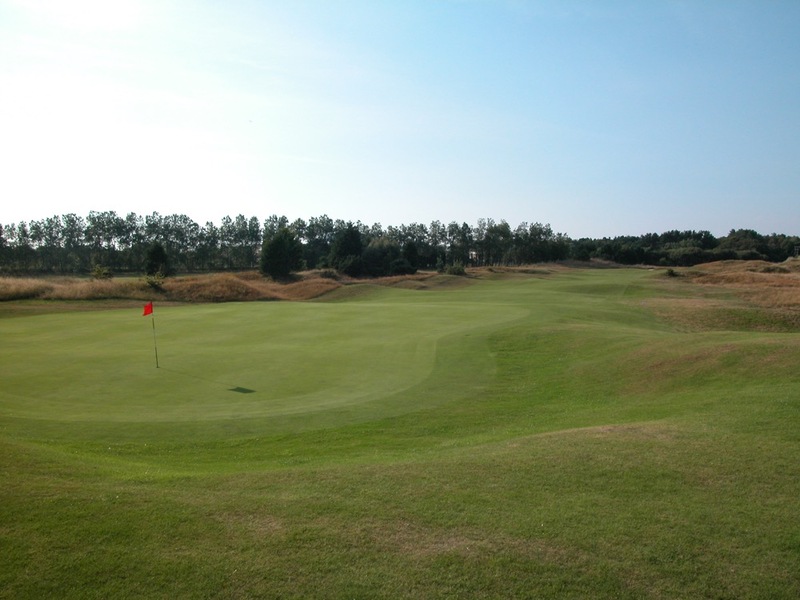 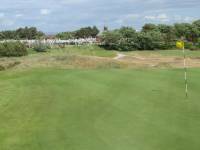 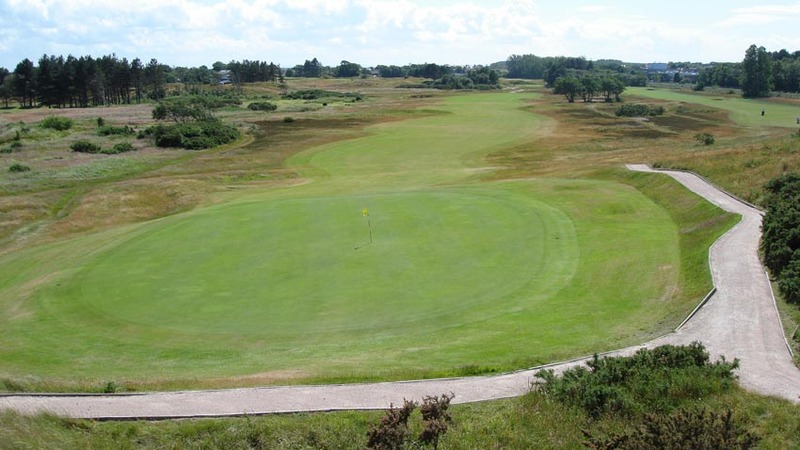 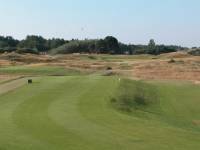 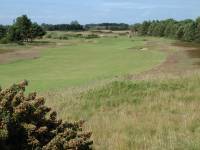 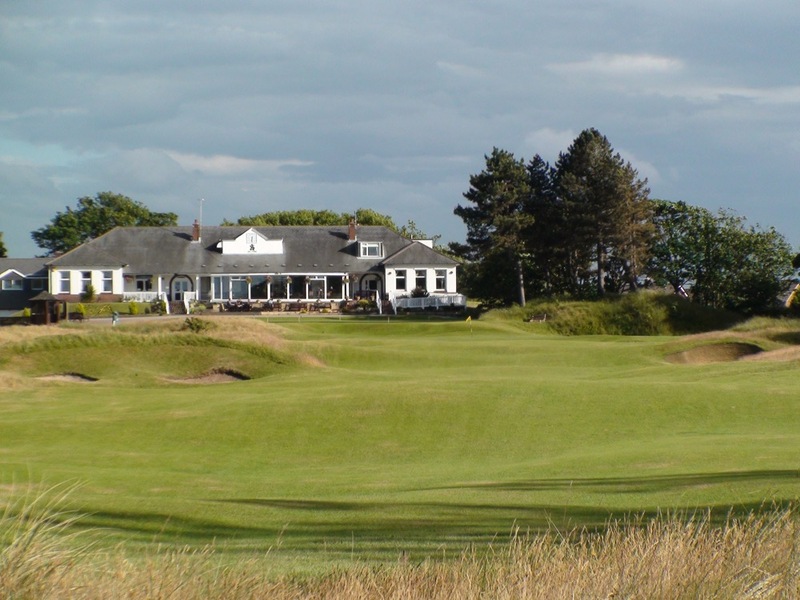 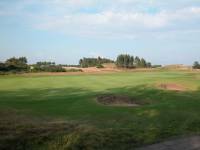 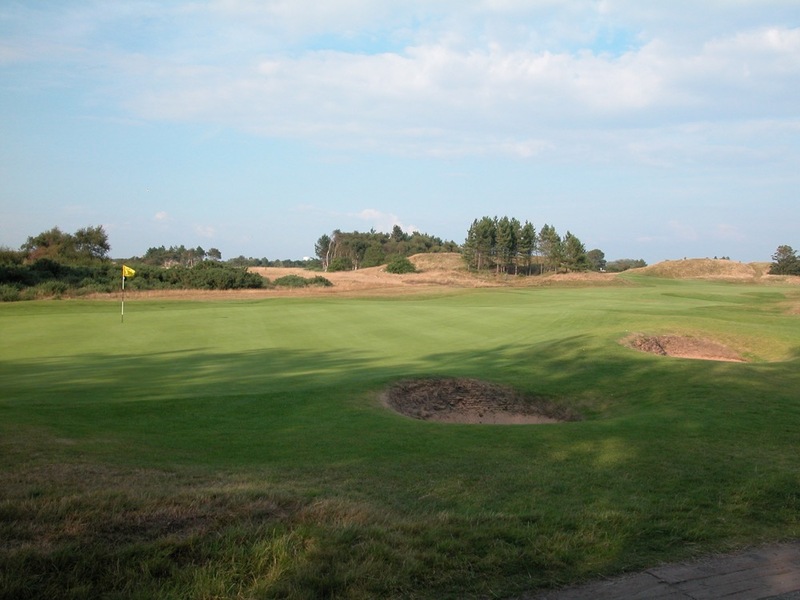 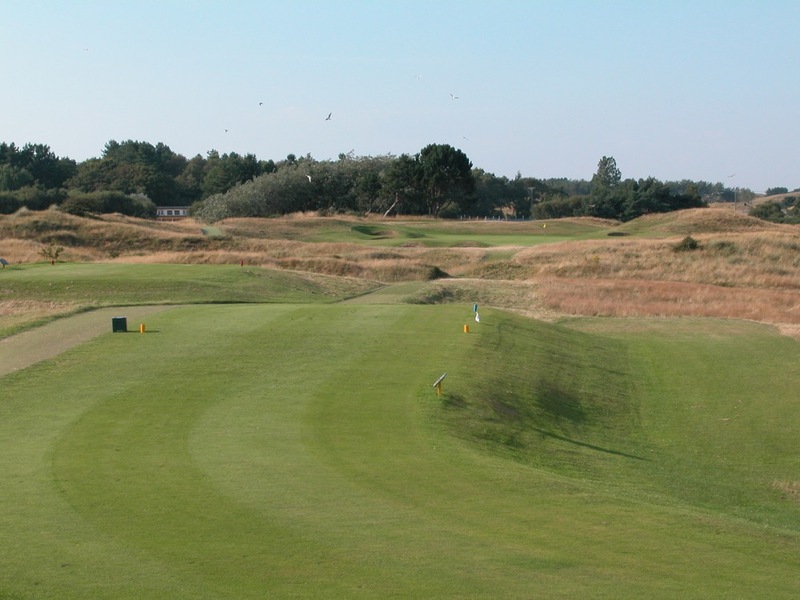 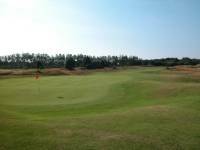 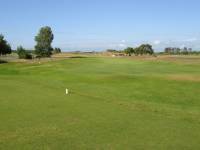 But the back nine at Southport and Ainsdale Golf Club offers something even better—the 17th hole. 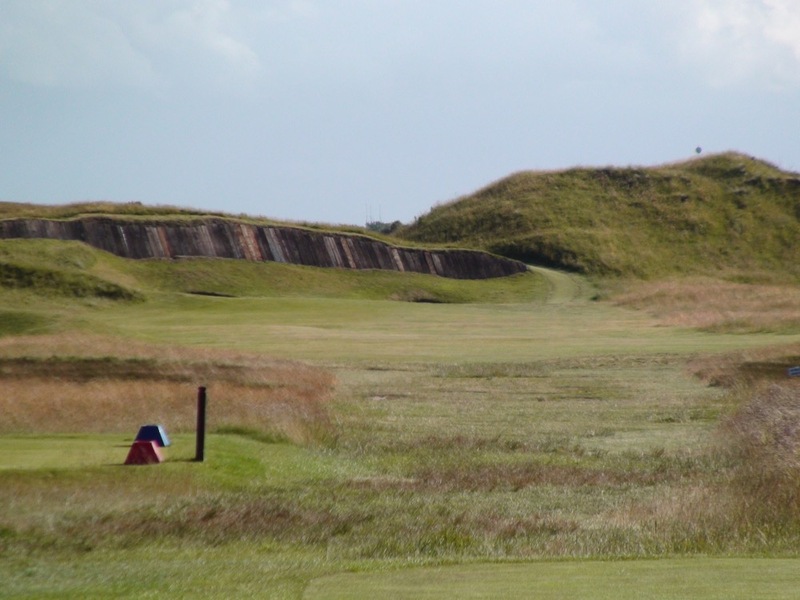 This one-of-a-kind par 5 is bisected by a Prestwick Golf Club Cardinal-bunker-like cross bunker shored up by menacing railway sleepers. 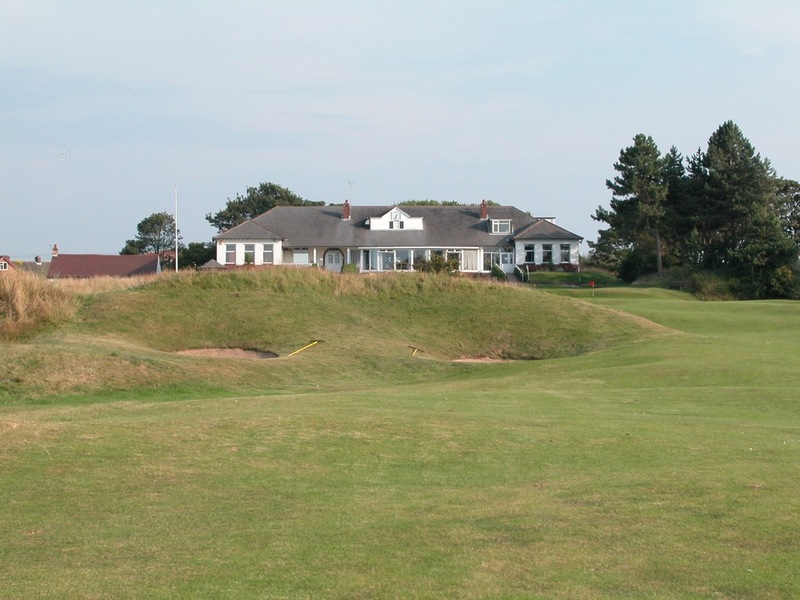 This bunker at Southport and Ainsdale Golf Club is called “Gumbley’s,” presumably named after poor Mr. Gumbley who must have spent a great deal of time in there. 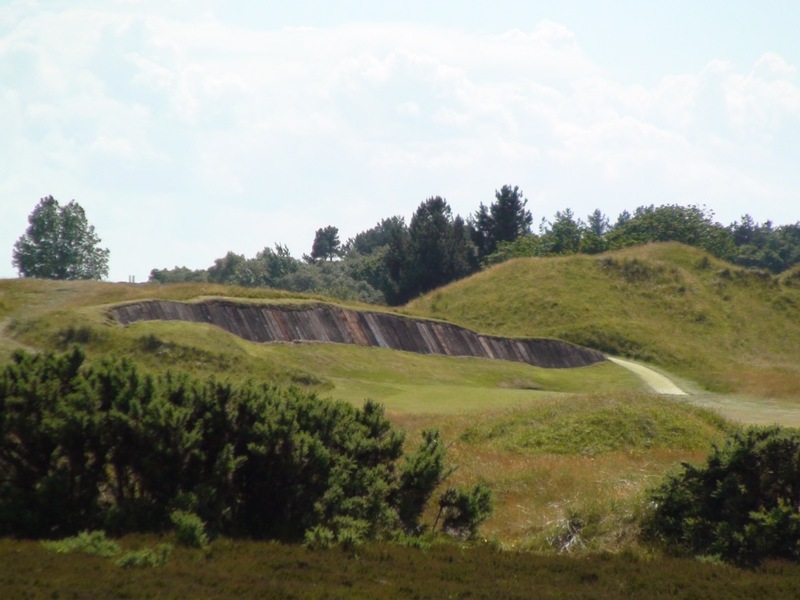 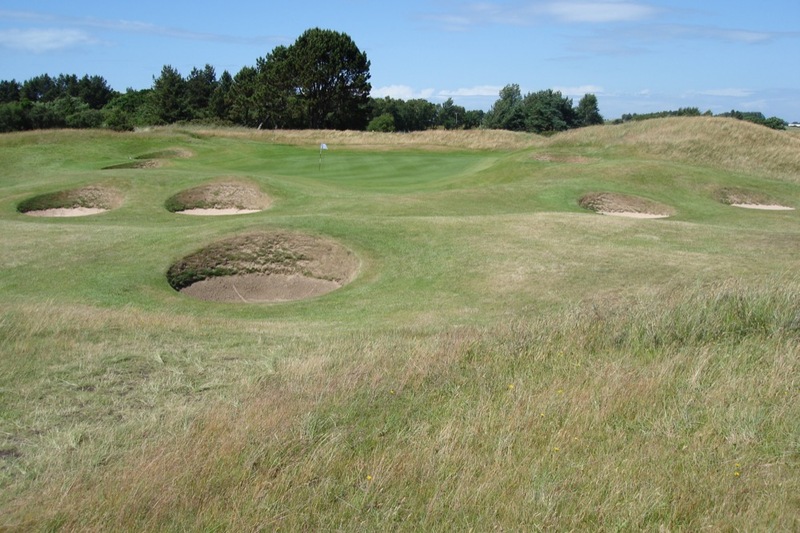 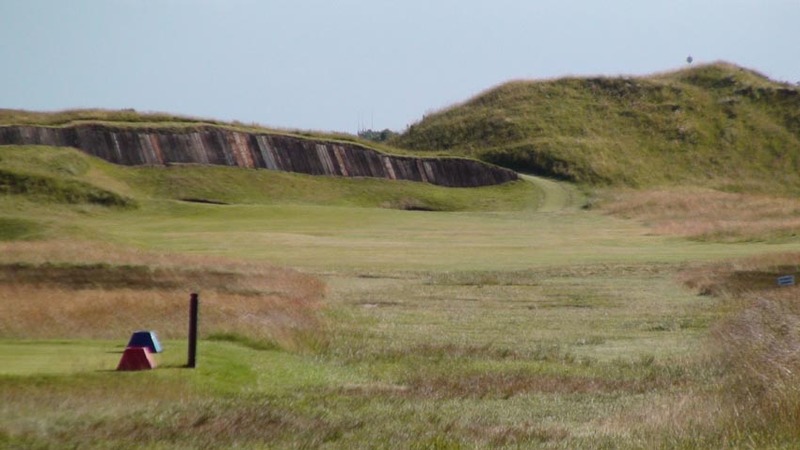 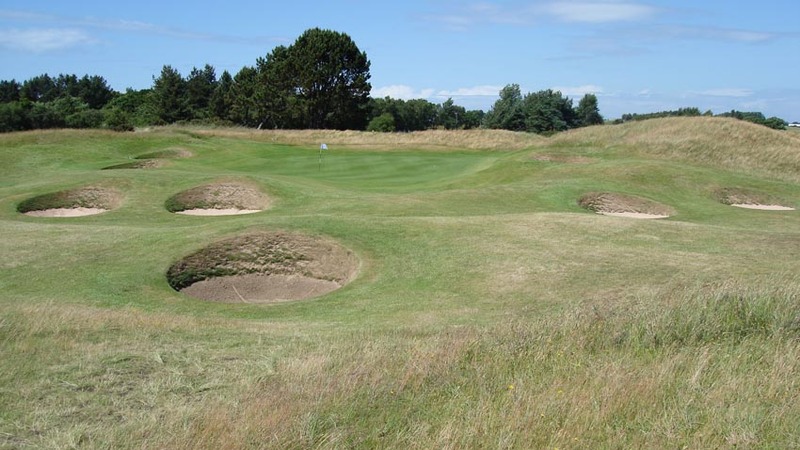 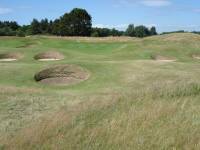 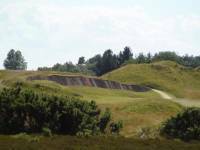 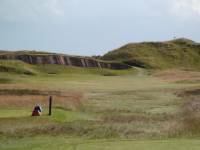 Gumbley’s puts Southport and Ainsale Golf Club on the short list of homes to the most menacing individual bunkers in England, along with the Cape at Royal North Devon and the respective Himalayas bunkers at both St. Enodoc and Royal St. George’s. 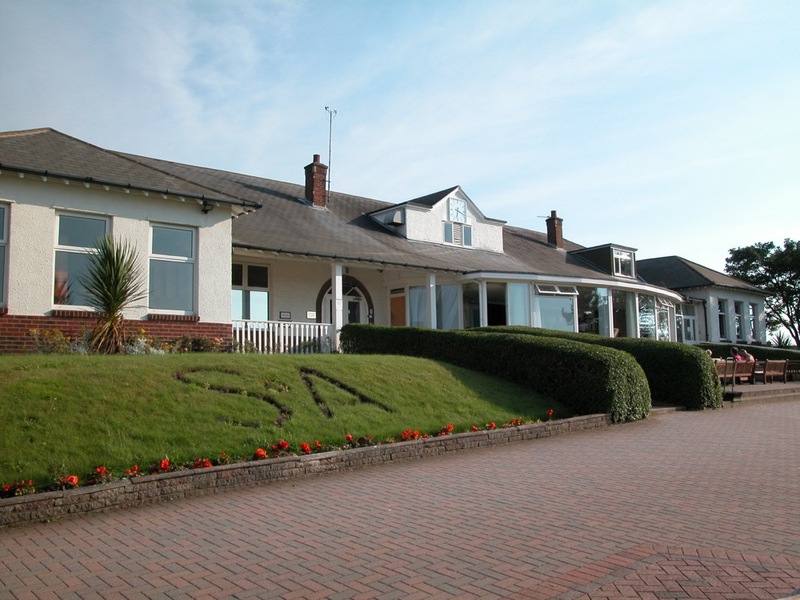 The members’ bar in the clubhouse at Southport and Ainsdale Golf Club is a superb place to contemplate the day’s adventures, with a great panoramic view of Southport and Ainsdale’s 1st and 18th holes, including the “Ryder Cup Room” displaying a terrific collection of memorabilia from that and other historic club events. 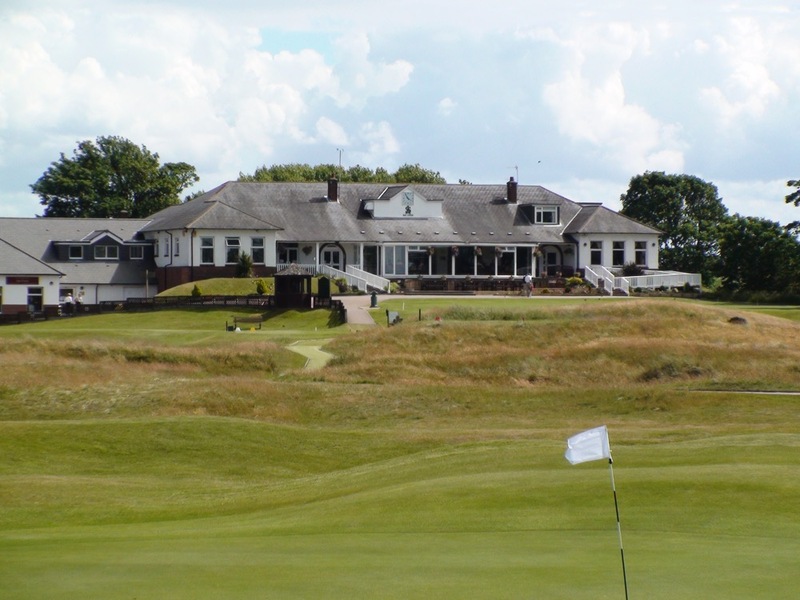 Always an Open Final Qualifying venue when held at Royal Birkdale, Southport and Ainsdale Golf Club is another gem not to be missed in this incredible cluster of golf in Southport England!